It’s been tremendous fun getting to know Emily. We’ve partied together outside of a symphony-less Symphony Ball – we’ve dressed in blue and white for the Finnish It! campaign – and we even ended up sitting next to each other at the grand re-opening of Northrup Auditorium, which also happened to be Osmo Vänskä’s first concert back as music director of the Minnesota Orchestra. In an exquisite twist of fate, that concert fell on May second, the first anniversary of YMM’s formation. Emily started playing piano at five. 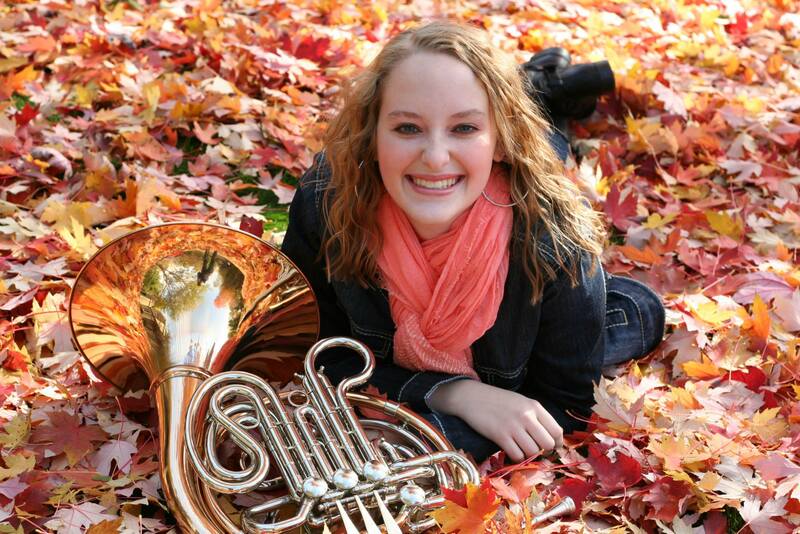 Now at seventeen she is an accomplished horn player who has performed with the Minnesota Youth Symphonies, the MacPhail Wind Quintet, the Minneapolis Pops Orchestra, and the MMEA All-State Concert Band. This will be her senior year of high school. You can listen to a fabulous Minnesota Public Radio interview with her here. For this Q&A, I wanted to ask her a few questions about her dreams and goals, the role she envisions young people playing in orchestral music, and the exciting concert that YMM is presenting at the University of Minnesota on August 1st. EH: What specifically were you hoping to accomplish with YMM when you began? Did you have any specific goals at the beginning, or did you feel more like, this is a horrible situation and we need to do something to make our viewpoints heard and we’ll figure out the exact logistics of it later? EG: When YMM began, I actually wasn’t expecting the group to become an “official” established organization. Our Facebook group “Young Musicians of Minnesota Support LoMOMO” was just a basic name that we came up with to describe who we were and what we intended to do. In fact, I wasn’t expecting to accomplish anything beyond making our YouTube video! After the video was created, students continued to ask me “What’s next? What can we do now to support the musicians?” and that’s when YMM’s journey fully began. EH: So fast-forward to July 2014. The lockout’s over. You’ve said that the mission of YMM will stay the same, “to keep music alive in Minnesota.” And YMM isn’t alone in that goal; the two other audience advocate groups that formed during the lockout, Orchestrate Excellence and Save Our Symphony Minnesota, are still going gangbusters, too. I think they’re actually busier now than they were during the lockout! Which is maybe something outsiders don’t understand; it might seem like – “oh, the lockout’s over, why are these audience advocate groups still around? what are they doing?” So what are you guys doing? What does YMM have up its sleeve for the 2014-15 season? EG: Oh, YMM’s got a lot up its sleeve for the 2014-2015 season. Instead of “it’s time to make music again,” we’re “keeping the music alive” and bringing music to the young generation of students in our community. YMM will continue to offer experiences to students that preserves and promotes classical music, whether it be offering YMM members discount tickets to sit in the “YMM section” of Orchestra Hall at Minnesota Orchestra performances, holding chamber performances in their lobby, sitting in rehearsals and shadowing the Musicians for a day, touring the MOA’s offices, providing information and resources to students about other music organizations in the community, and holding our very own annual YMM Summer Music Festivals. Not to mention our soon-to-be YMM expansion to Duluth! EH: Do you know of any youth orchestras actually run by high school and college students, like yours is? I haven’t done a ton of research on the subject, but I’ve never heard of another organization quite like YMM. EG: I have not. That’s what makes YMM so unique–it’s rare to find students who are so determined to work together in order to keep something that they’re so passionate about, alive. EH: Do you think a YMM model – say, a student-run orchestra with a sort of activist bent to it – could be transplanted to other communities? Or do you think that model would only work within the unique context of the Minnesota Orchestra meltdown? EG: Students feed off of each other’s energy and enthusiasm. All it takes are a few strong leaders, a passion and drive to keep classical music alive, and you’ve got your orchestra and organization! It’s time that young musicians nationwide–even worldwide–band together and stand up for what they believe in. YMM-modeled groups need to be thriving everywhere. It’s time to organize a multi-state and multi-nation movement! EH: Everyone in the music biz is looking with dread to the end of July, as it appears the Met musicians are going to be locked out. The rhetoric over there is sickeningly similar to what happened in Minnesota. And as I’m sure you know, their general manager Peter Gelb has recently said that the audience for classical music and opera is dying, and that young people just aren’t interested in either of those art forms. And that’s in New York City, which is supposed to be the cultural hub of the United States. And if Peter Gelb is right, it’s clear that you and I are booking passage on the Titanic, professionally speaking. So I mean, you’ve got to have opinions about that whole Gelb-ian position. Is there something to what he says, or is it just lazy thinking, or – ? What would you tell him, or someone who feels the same way he does, knowing that there’s such persistent pessimism about our demographic’s involvement with orchestral music? EG: You just got to look around you. The music students are EVERYWHERE. Music schools around the country are packed full of aspiring professional musicians, youth programs are often filled to the brim with elementary, middle, and high school students. Just about every school in the nation has a band or orchestra, if not several. Give students a place where they can gravitate and expose themselves to the world of orchestral music, and they will. That’s why many music schools are right in the hubs of the music industry. New York, Chicago, California, Nashville . . . Students follow great music. That’s one of the reasons YMM has been as successful as it has. Students are thirsty for great music. Give it to them, and you’ll have a mob on your hands. In just 12 months, YMM went from being non-existent to consisting of over 610 students–and yes–that’s ONLY in Minnesota. EH: Describe your relationship with the Minnesota Orchestra musicians. I think they’re the kindest people I’ve ever met. Have you had the same experience? Did you know any of them pre-lockout? EG: I didn’t know many Minnesota Orchestra musicians pre-lockout, just the few that I had collaborated with through my private instructor or had received sectional coachings from in Minnesota Youth Symphonies. The Minnesota Orchestra musicians make it easy to do what I do every day with YMM. They remind me why I spend countless hours doing redundant drudgery, or why I put in so much work to make sure that every YMM event is successful. They alone are the raw inspiration as to why YMM was founded in the first place. They are the kindest, most genuine people you will ever meet. I cannot describe in words what it’s like to walk backstage before one of their concerts and to be greeted with countless hugs and smiling faces. Or to have YMM students performing in the lobby before a concert and to see some of the Minnesota Orchestra musicians come out to hear the students perform; introduce themselves, shake their hands, and thank them for performing. The musicians even come in and volunteer their time, coaching our YMM orchestra members, and perform alongside us in our concerts . . . . We’re all one big happy family. I couldn’t be more proud to call Minnesota my home, and the Minnesota Orchestra my orchestra. EH: Newly reappointed Music Director Osmo Vänskä. Discuss. EG: I think I did the happy dance times one million when I heard this announcement. Couldn’t think of a better man to get the Minnesota Orchestra back on track and lead the Minnesota Orchestra in their first official season back than Maestro Vänskä himself. 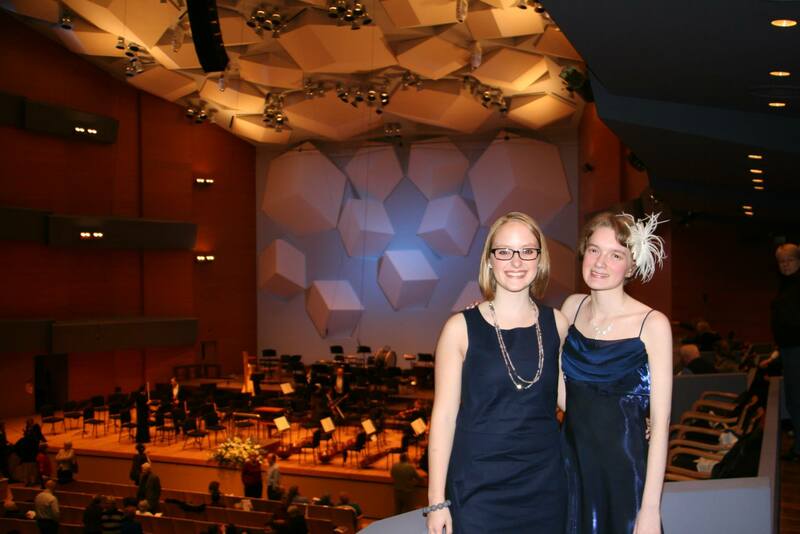 Emily and Emily at the historic Minnesota Orchestra Grammy celebration concert, March 2014, a few weeks before beloved conductor Osmo Vänskä was re-instated there as music director. EH: I wanted to talk about the YMM summer music festival concert. It’s August 1st at Ted Mann Concert Hall in Minneapolis at 7pm. You guys played Tchaikovsky 4 last summer, and now you’re taking on Tchaik 5 this summer. Is Tchaikovsky just fun for you guys, or is there some kind of deeper meaning to programming him twice, or – ? EG: I think our YMM orchestra does a fine job of performing Tchaikovsky’s symphonies, and his work is at a manageable skill level for our musicians to handle. With the Minnesota Orchestra lockout just ending months ago and this being YMM’s first performance post-lockout, we have decided to select “celebratory” repertoire to reflect the fact that our Minnesota Orchestra is home, as well as the fact that Maestro Aaron Hirsch, YMM’s Artistic Director, will be heading off to graduate school in Washington state this fall. EH: Why should people come to this concert? Stretch your promotional muscles. Really sell me on it! EG: YMM is truly unique in many ways. As stated before, YMM’s operations are all student-led–this concert is entirely being put on by the young musicians that we have in our state. Practicing, rehearsing, booking concert venues, fundraising, creating the concert program, you name it. We do it. Not only are we unique in that way, but no other organization has such a wide diversity in student ages and ethnicities. Youth orchestras often offer their programs to students through high school. However, in YMM, our youngest student is a mere 13 years old, and our oldest student is 26 years old. Many students want the opportunity to continue playing their instrument through college but aren’t music majors, and maybe can’t afford to go away to a summer music festival. YMM’s 2014 Summer Music Festival has offered a summer orchestra program to students ranging from middle schoolers, high schoolers, college students, and college graduates, all wanting the same common mission–to perform some great music at a high level, make new friends, have fun, and to continue keeping the music alive–all for no cost. When are you going to be able to sit down and say that you’ve heard a youth orchestra perform Wagner’s Flying Dutchman Overture? Even better: a STUDENT-LED youth orchestra? Performing with guest musicians from the Minnesota Orchestra? And say the concert was FREE? Never. YMM consists of the next generation of professional musicians. And let me say, they’re working their butts off to ensure that the crowd will react nothing less than with a roaring applause and standing ovation. Who knows? Maybe we’ll even throw in an encore. Guess you’ll have to come and find out for yourself! 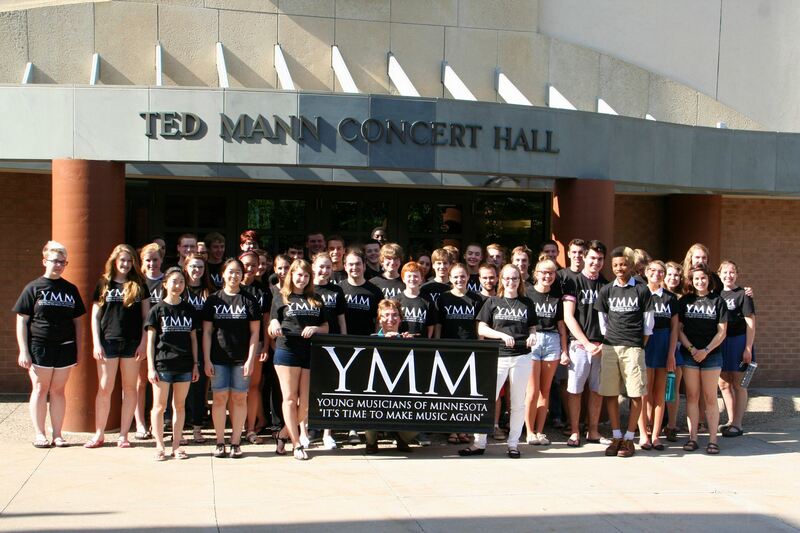 Come hear the Young Musicians of Minnesota’s 2014 Summer Music Festival participants in their grand finale concert at Ted Mann Hall, and hear a little more about what we have in store for next season! You won’t want to miss it! EH: And you’re raising money to pay for the concert hall rental. As of this writing, you’re 73% to your goal of $4500. [And as of yesterday, they’ve already reached their goal, with nine days to spare!] Congratulations on that, and can you maybe explain a little bit why you’re doing that? Why Ted Mann Concert Hall? EG: YMM is performing at Ted Mann Concert Hall because of the high demand we need for more space, access to percussion equipment, and a hall that seats more people. Since last summer, our YMM orchestra has grown from 46 musicians to this summer’s 72 musicians! With such a substantial growth, we are unable to use the MacPhail Center for Music’s Antonello Hall and the Breck School’s theatre because our orchestra is too large to fit on stage. We are an ever developing and growing organization, and are expecting a larger audience than our previous venues have been able to seat as well. Renting Ted Mann Hall is the next step that YMM needs as it develops and evolves after the Minnesota Orchestra lockout ending! Emily Green, future CEO of the Minnesota Orchestra! EH: You’re graduating from high school next year and hoping to go into arts management, which is a career path the lockout inspired you to take. And I know it’s a dream of yours to become the CEO of the Minnesota Orchestra. So. The search committee is currently searching for Michael Henson’s successor. Pretend you got that job tomorrow. What would be your three top priorities? EG: My first priority would be to establish good communication, between all departments of the organization. It’d be important for me to meet with each department, hear about what they’re currently working on, address any issues they may have, and maintain a relationship with them throughout my days with the Minnesota Orchestral Association. My second priority would be to make sure that we’re interacting with the community. Many people don’t realize it, but community in and of itself is a huge promotional factor for an organization. Holding free concerts for the community, community forums, meet and greets with your musicians, etc, can highly benefit how your patrons and donors perceive the organization. That’s how you gain audience members: community outreach! Lastly, I find it very important to make sure that the venue that “represents” your organization (in this case, the Minnesota Orchestra’s home is Orchestra Hall) is presentable and reflects your mission. Orchestra Hall is a center for the arts, and should look like an arts hub–simple things like putting a grand piano in the lobby and holding performers before the Minnesota Orchestra concerts, displaying the Minnesota Orchestra’s Grammy (or a replica), honoring our past Minnesota Orchestra conductors and musicians through plaques . . . The possibilities are endless. Orchestra Hall needs to reflect the Minnesota’s Orchestra’s history. Anyone should be able to walk in there and say “this is the home for a world-class symphony orchestra”. EH: Why do you think more young people aren’t interested in arts administration? Is there a big group of us somewhere I haven’t met yet? Because I’ve dreamed of running my own music festival since I was in my early teens. And as best as I can tell, that’s a pretty far-out nerdy goal, even in the music world, which is full of people with far-out nerdy goals. I really wish that more young musicians aspired to leadership positions and board positions and that sort of thing. Agree, disagree? What are your thoughts on the whole subject of young people and arts administration? EG: I believe that the reasoning behind the lack of interest in arts administration is that nobody knows about it! I didn’t know that there was a such thing as an MBA in arts administration until someone recommended it to me. Students don’t receive those administrative kinds of opportunities, to see the behind-the-scenes to organizations, such as the Minnesota Orchestra or even YMM. The community needs to provide more opportunities for students to learn about the music administrative world and what it entitles. I am currently interning as a “student CEO” with the Mississippi Valley Orchestra, who happen to be working with me to develop a permanent arts administration “student CEO” position with them, so that more students in the future can experience what I have. Without YMM and the Minnesota Orchestra lockout, I would’ve never found my passion to want to become the CEO of a major symphony orchestra. Arts administration is a new industry, and has all the potential to become very successful if enough people are exposed to it. EH: One last question. I have my own complicated thoughts on this topic, and maybe I’ll verbalize them someday, but I’m super curious what you think… From your current perspective, did the Minnesota Orchestra lockout strengthen the institution or weaken it? Or was it a net wash? Because yes, a lot of very bad things happened, but some amazing things happened, too. Amazing things. Like YMM, and our friendship, for instance! EG: The Minnesota Orchestra lockout strengthened the institution, in my opinion. Even though the lockout did a lot of damage and hurt a lot of people, organizations such as YMM and SOSMN would have never come to existence without it. The Minnesota Orchestra musicians wouldn’t have such a strong bond with the community as they do right now, specifically with the music students who participate in YMM. Beautiful things grew out of the dark storm. We just have to remember that the storm is temporary and the resultants of the storm will be around forever. Now is the time for musicians, patrons, and the Minnesota Orchestra board to band together and rebuild what was destroyed. We’re breaking down the walls that separated each department of the MOA and breaking down the fourth wall between the orchestra members and the community. I have all the hope in the world that lockout might just be the thing that the Minnesota Orchestra needed in order to evolve into one of the most thriving and successful symphony orchestras out there. It’ll be a slow and steady process, but we’ll get there. Without the lockout, I’d still be a typical high school senior hoping to major in actuarial sciences, attend a local college, and live at home. And now . . . Well, let’s just say in many more years you’ll be interviewing me again hopefully to ask about what I think about my new position as the Minnesota Orchestra’s newest (and youngest) President and CEO. Let’s totally plan on that! YMM’s Kickstarter has reached its goal to fund the Ted Mann rental, but you can still donate to cover the cost of future events. Keep up-to-date with YMM by following their Facebook page. This young woman is so impressive! I think the MOA should hire her now! I agree with her1000% that the lockout strengthened the Minnesota Orchestra in all the ways she described. We are so luck to have you two Emilys in our midst. It is a grand inspiration what the two Emilys have accomplished and are still doing. The YMM, ORCHESTRA Excellence, SOS and MUSICIANS OF THE MN ORCH are all truly amazing. I did catch the fun and significant Eiji Oue concert in December and knew that you there. This almost makes me want to move back to MN. Emily is pretty awesome. I love how she viewed the lockout. It is hard, incredibly so, to keep the faith when difficult stuff like that happens and I am glad, no actually, genuinely impressed that she can see that happen and still be optimistic about the future. My second priority would be to make sure that we’re interacting with the community. Many people don’t realize it, but community in and of itself is a huge promotional factor for an organization. Holding free concerts for the community, community forums, meet and greets with your musicians, etc, can highly benefit how your patrons and donors perceive the organization. That’s how you gain audience members: community outreach! Hey! I’m John, a violinist, music lover and orchestra advocate. The biggest issue facing the orchestras is creating demand and forms that make money. Not just fund raising and donations but something that sells tickets. In the 1700’s, there was a high demand because people needed music and there were few entertainment choices. Imagine no tv, internet, video games and less career choices. Always feel that it created pressure for the orchestras for styles with original fine performances and in turn to make money. I’ve experienced so much incredible new technology, that it’s hard not to see having a solution for the orchestras problems. Loved your article on Violinist.com and will keep following your posts. See ya!